Spring time and late afternoon sun seem to always produce fun pictures. 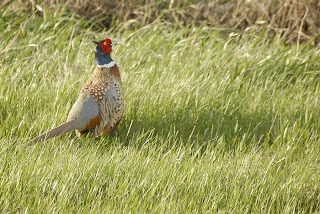 Last night on the way back from Huron to Pierre I took advantage of the abundance of wildlife along the roads. 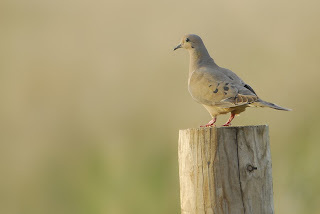 While stopped to focus on a bird on the fence along a gravel road near Ree Heights I heard a rustling right underneath the car window. As I looked down a large furry black and white tail rose out of the grass. 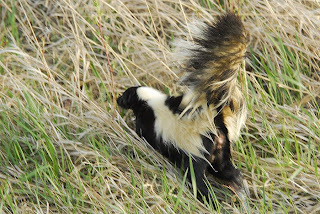 For a second I wondered if quickly rolling the window up would do any good, but then the photographer instincts took over and I aimed my camera at the skunk as he jumped into the water-filled ditch and swam away. He never turned back to look at me and I obviously wasn't shooting my best with the sudden scare, but at least I got the business end of a skunk. Boy you have to watch out for them Ree Heights stinkers. Yep, you'd think the people around there would have taken care of those things by now. I would have stopped in to say hi if I had seen anyone in the yard, but instead just buzzed on by.